When Garey White was seven years old, his father gave him a calf as a reward for doing chores on the family farm. The young entrepreneur then did what any industrious kid with a passion for construction would do: he sold the calf and bought a basic carpenter’s tool set. Thus was born an engineer who would go on to found the largest non-residential construction employer in central Kentucky. Mr. White began his college career at Transylvania University, but his studies were interrupted by World War II, which took him to Europe for two years of service. He returned to Transylvania where he earned a bachelor’s degree in mathematics in 1948. Mr. White then enrolled in the civil engineering program at the University of Kentucky and graduated in 1951 with an offer from Roberts & Schaefer Co., of Chicago, Ill., and an ambition to design exotic concrete structures. 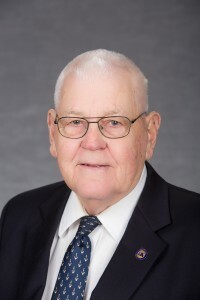 After six and a half years with Roberts & Schaefer and rising to the position of project manager, Mr. White returned to Lexington and became the chief estimator with Hargett Construction Co. After four years with Hargett, he co-founded Lane, White & Congleton Co., in September 1961. They won their first bid two months later. The firm, later renamed White & Congleton, billed $950,000 in projects its first year and grew to increase this by an average of $1 million per year. White & Congleton would build Murray State University’s football stadium, as well as a 14 story classroom, the Pattie A. Clay Hospital, H.K. Porter manufacturing plant, Chandler Medical Center power plant, 10 major bank buildings and several other projects at UK and Eastern Kentucky University. In 1967, Mr. White co-founded Bluegrass Art-Cast, Inc. (BGAC) which produced high-quality custom designed architectural precast concrete building components. BGAC’s market covered 15 states and their sales grew to where two production plants and over 100 employees were necessary to meet demand. In 1986, Mr. White was approached by UK College of Engineering Dean Ray Bowen about launching a construction program within the college. Not only did Mr. White accept the challenge, he sold his construction interests with White & Congleton (now Congleton-Hacker) and taught three classes as a full-time associate professor of civil engineering. In addition, he formed and led an Industry Advisory Committee consisting of 11 other contractors. UK’s Construction Engineering and Project Management program continues to be a vital part of the Department of Civil Engineering. While teaching at UK, Mr. White began serving as an arbitrator. His most prominent case involved deciding over 130 separate issues in a $4 million dispute with Ford’s Louisville Assembly Plant paint shop. Until recently, Mr. White has served as an expert witness in court cases related to construction. Among his many honors, Mr. White has been named Kentucky Society of Professional Engineers Constructor of the Year and received the Association of General Contractors of Kentucky Lifetime of Excellence Award. Mr. White lives in Lexington, Kentucky. His wife, Carol Ann, passed away in 2016. They have three children.